Today, lets talk structures or products created specifically to be built upon. 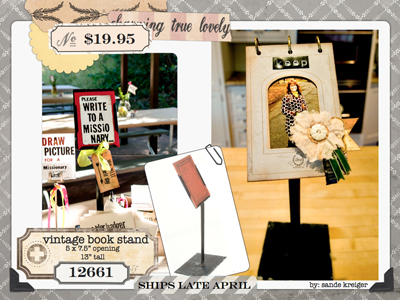 This stand is 18" tall and was created to hold a 5 x 7 journal. Remember yesterday when I said the new book covers were 5 x 7 1/2" so the rings could be at the top? This is why. Of course that does not mean you have to put the book covers in this holder, just that it is an option. Now when you create a mini book, you have a place to display it. Super cool idea, right? I have another use for the stand to share with you after I return from CHA. A super easy project and a download I think you will like. So, moving on we have book board kits, three of them to be exact. I love book board, heavy enough to take paper, paint, glue, gesso, more paint. Great for collage and layering yet heavy enough to stand up. 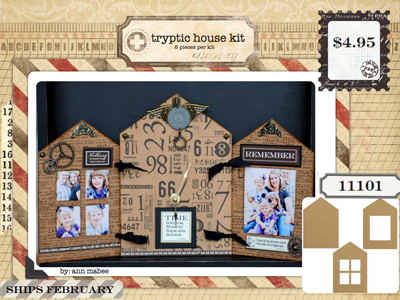 The first two kits were created as triptychs but can be used for so much more. • a set of three associated artistic, literary, or musical works intended to be appreciated together. The first book board kit is a house shape. The center piece is solid about 8" tall and the side pieces are shorter, about 7" tall and have windows cut out (the window pieces are included in the kit). In the picture below, Ann has made the center a clock (can you see the gold hands now?). She tied her triptych together but it could also be ringed or hinged. The second is kit is a classic arc shape and again the cutout pieces are included in the kit. I have not seen the mixed media book shown here in person but I think Kerry Lynn used the two side pieces for the cover, covering them with fabric and then using a beautiful distress technique over the fabric. I am sure Kerry Lynn will be showing this on her blog once the show is over and she is able to post. 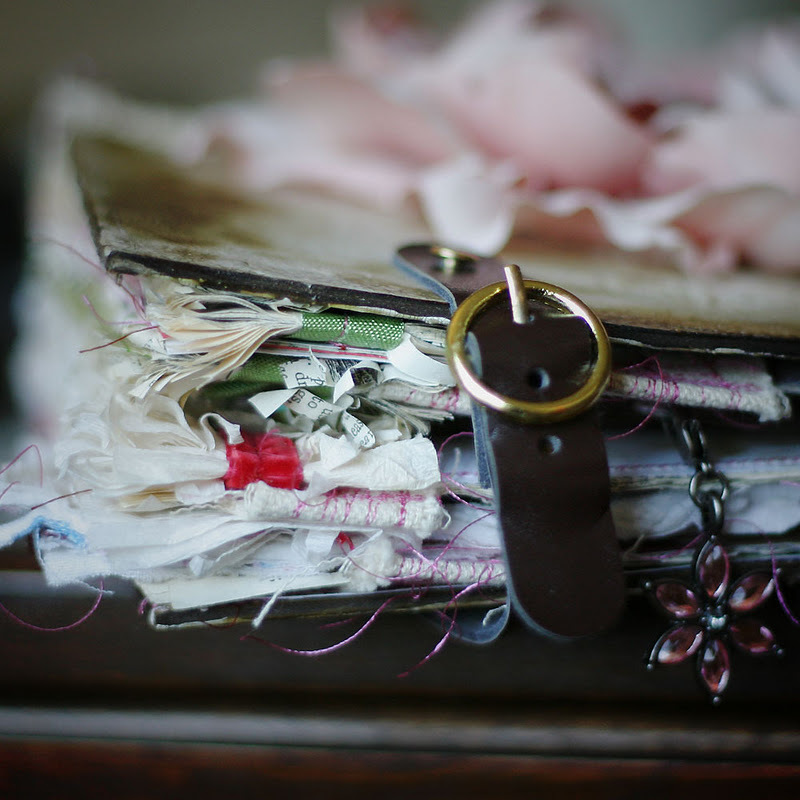 I am looking forward to learning how she sewed the pages and hinged it all together. 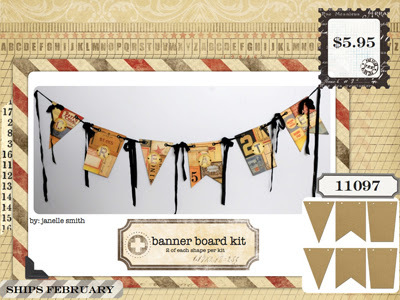 The last board kit is a banner. 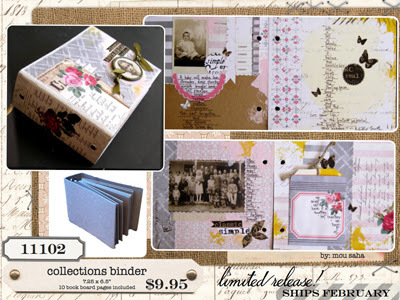 Love this one that Janelle created using the Ancienne Ephemera. And last up is the Collections Binder made from book board. Mou Saha made this beautiful sample using the Trousseau collection. Love her mixed media work...definitely swoon worthy. Okay, that's it for today. Tomorrow is the last day of preview here at OneLuckyDay since we are off to the show very early Friday morning. It will take me about 4 1/2 hours to drive to Anaheim so I may have to just sleep in my car so I will be ready to go at 5am! I love all the new products in your sneak peeks! Have a fun and safe trip to Anaheim. Oh, how very beautiful!!! I can't wait for more book covers! Well crap! Another one I gotta have. Can somebody float me a loan?! 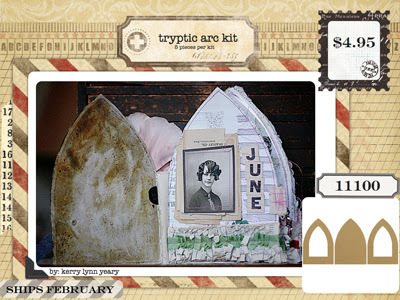 fabulous kits, i love the triptych arches! Looking forward to seeing it all in person on Sunday!